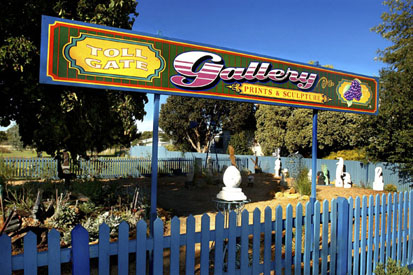 Toll Gate Gallery and Sculpture Garden is an artist run gallery exhibiting paintings, linocut prints and sculptures. It is located on the Western Highway in Great Western, two and a half hours drive north west of Melbourne. The historic wine producing town of Great Western is located between Ararat and Stawell and is home to prize winning wineries Seppelts and Best's Vineyard. The town makes an ideal stop on the way to, or from, the Grampians and the region's many wine producers.